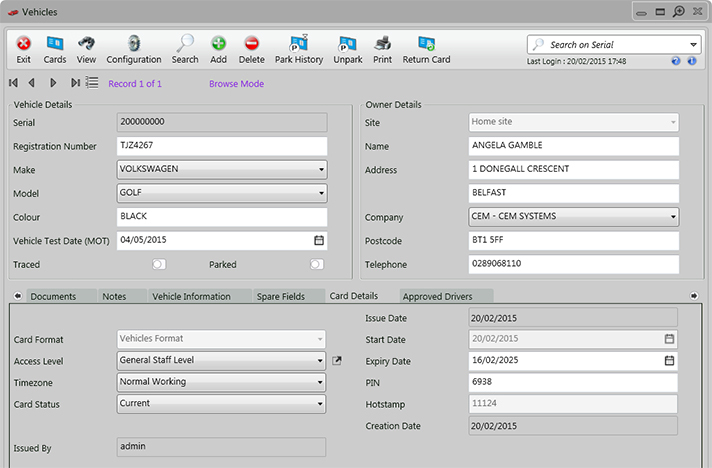 The AC2000 Vehicles application allows users to produce a professional pass or vehicle tag for all vehicles which require access to secure areas, with the ability to associate cardholders to vehicle records. The AC2000 Vehicles module is used to store details of vehicles on the AC2000 access control system such as Vehicle Make, Model and Registration number. Where vehicle access control cards or tags are used the vehicle is treated in the same manner as cardholders; with vehicles only gaining access at readers where they have correct access permissions.